$29.95 to buy a 1 month premium subscription. $44.85 to buy a 3 month premium subscription. $95.40 to buy a 1 year premium subscription. $199.95 to buy a VIP lifetime premium subscription. Feed: Check all the latest news. Members: Look and search for women through the members section. Live Girls: You can watch girls on their webcams (if you want to pay a per minute fee). Photos: See photographs of all the females on the site. Videos: Watch adult videos for a fee. Blog Posts: Read member blogs or create your own blog. Mail Box: Check who emailed you and send out emails to other members as well through this section. Friends Requests: See when wants to be your friend. Who Viewed Me: Check out who has viewed your profile. This review is on a dating site called Lust.net. We have already started investigating the site and we know that it is associated with a known scam that we have already exposed called CougarCrush.com. Please read the full review below. Agree To The Use And Nature Of "Generated Cupids"
Before you can get access to Lust.net you need to agree to the "use the nature of generated Cupid profiles". I took a snapshot of the home page and circled in red where this statement was written. FYI, generated Cupid profiles are fake dating profiles. This is a verifiable fact that we will get into later in this investigation. Just understand that when you agree to the terms and conditions and the use and nature of generated Cupid Cupid profiles you are basically agreeing to getting scammed. 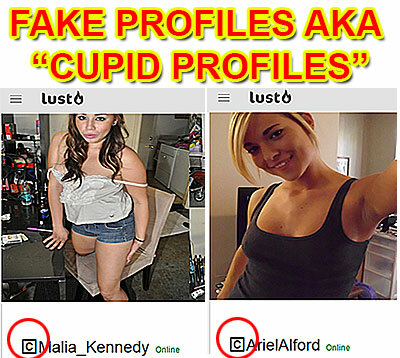 Fake Profiles AKA "Cupid Profiles"
If you come across any dating profiles on the site that has the letter C with a square around it be forewarned that those are fake dating profiles. The women in those profiles are not real members of the site. The truth is those fake profiles have actually been created by Lust.net. You may find it hard to believe that a dating site would go to the length of creating fake profiles. Once you realize how the site operates and that there are millions of dollars to be made, then corruption and fraud are always a part of the equation. Please look at the example we have shown below of just two of the profiles that contact us. Circled in red is the logo that signifies that those are fake dating profiles. All the messages received were from fake Cupid profiles. As you can see from the evidence below the messages came from fake girls you can see the logo signifying that it's a Cupid. If you have an account on the site take a look and see if you have also been contacted by these fake profiles. The funny thing is you need to get a premium account to read any messages from the phony women that send you fake emails. This is essentially how the whole business operates, they create fake dating profiles, then they send out fake messages that appear to be coming from those women and then in order for you to read those messages you need to upgrade and purchase a premium account. It's one big fraud. We find it absolutely hilarious that when you upgrade they list all the reasons to upgrade. And, one of the reasons to upgrade according to them is to be able to reply to members and to the generated Cupid profiles messages! That is astounding. They are telling us to upgrade so we can send and reply to emails from these fake dating profiles (see evidence below), seriously? Obviously people have fallen for this in the past or they still wouldn't have it on their site as a reason to upgrade your membership. Unbelievable. Below is the exact statement that we have copied from the terms and conditions page of Lust.net. If you read through them you will be very shocked to see they detail specifically how they use fake dating profiles and computer generated messages to get you to upgrade. Also you can click on this link which will take you directly to the Terms and Conditions page where you can read everything directly on their website. This evidence clearly shows that this site is involved in fraud. We are not lawyers and we don't know how the law work however you would think that them admitting to running a fraudulent dating site would result in some legal action taken against them for defrauding consumers? But once again we don't know how the law work and if they are actually financially or criminally liable for anything they have done. But as a consumer you can take things into your own hands and you can contact the Better Business Bureau and also delete your account on this site and stop paying a monthly membership if you are at the moment. Company Generated Cupid Profiles (marked with ) are created automatically for marketing, the improvement of the Service, and in order for our Registered Users to experience the type of communications that they can expect as paying Members. Company Generated Cupid Profiles may be introduced with a designated symbol , which is the sign on every item of interaction of such a profile. This site creates fake female profiles and tries to pass them off as legitimate female member looking to meet men. In the end it's all a scam to drain your bank account. It appears that you have not updated your review since 2015. I read the terms and could find no references to Cupid profiles.